Settled in the beautiful Blue Ridge Mountains is The Cabin at Woodridge Farm. 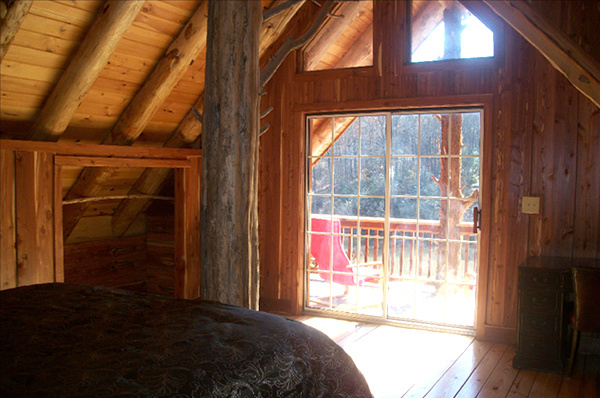 So much more than just a vacation rental, our custom, 2 bedroom, 3 story, hand built log cabin was made from local logs utilizing an onsite sawmill. The cabin is part of our 300 acre farm and is situated on a private rainbow trout stocked lake with sandy beach and uses natural mountain springs to feed the lake. From spring to fall enjoy the beach with all the tropical plants. Activities include fly fishing, trout fishing, swimming and hiking / backpacking along our mountain hiking trails. Enjoy kayaking or canoeing on a scenic 8 mile river ride on the Rock Fish River (river conditions permitting). Or go for a relaxing tube ride! Additional amenities: pool table, horseshoes, firepit/wood smoker on the beach, gas grill, wood cook stove, electric stove/refrigerator, microwave, 60 inch wide screen tv with satellite tv, ice machine, air conditioning. A great cabin rental for your next family vacation or romantic weekend!